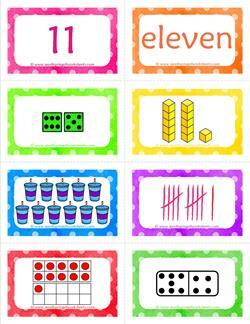 You're gonna love these brightly colored number cards for the number one! 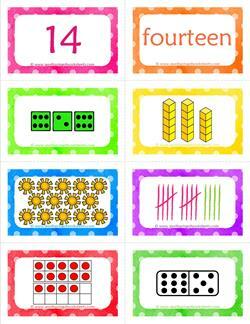 With a bow, a green dice, dominoes and more, there's plenty here. Two waving caterpillars are trying to get your attention! Look at these really cool number cards for the number 2. Gosh, they're so pretty, too! 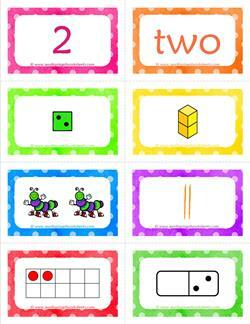 Go ahead, print it out. This number 4 number cards page has plenty to match and sort - base ten blocks, dominoes, ten frames, dice ... and four purple furry monsters! What fun! On the number card for the number 5 we got to cross the tallys! Join the fun. 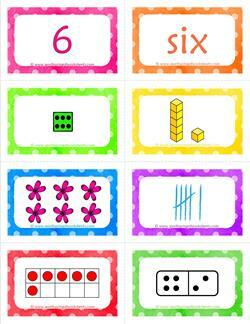 Count 5 by ten frames, base ten blocks and by reading the number "five". 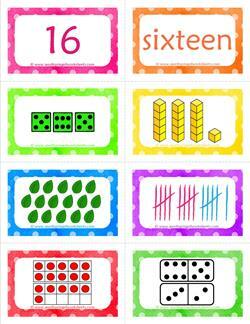 If the bright green dice on this number cards page doesn't catch your attention, the yummy looking cupcakes probably will. 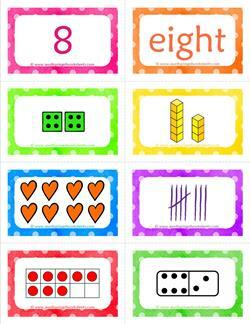 See how 7 is shown 8 ways! 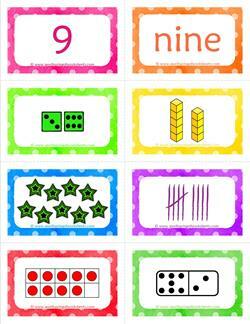 These number cards show the magic number of 10! Kids can count the ten frames, base ten blocks and more. But look at the books. Can they count them by 2's? 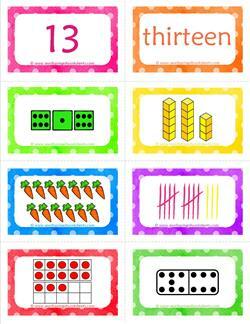 Number 13 on these number cards is no reason to be a bit superstitious. 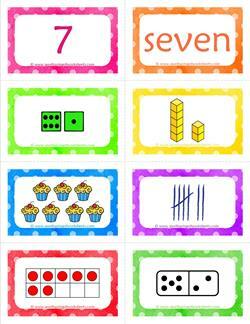 It's just as cheery as all the others and provides learning and fun! 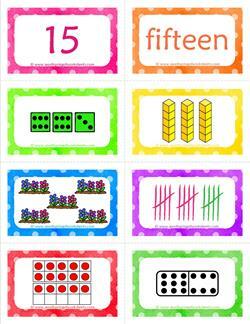 For the number 16 number cards a second set of dominoes had to be added and a third row of ten frames has started to be filled in. We're getting up there! What was added to these number 17 cards compared to the number 16 cards? If you guessed another dice was added, you are absolutely correct! 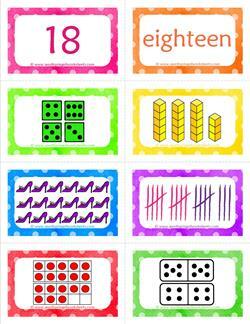 Here's a question for you - if you have 18 shoes, like on these number cards for 18, how many pairs is that? Count by 2's. See what you come up with! 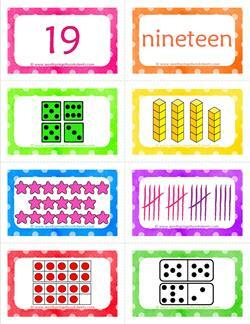 How many more stars do we need on the number card for 19 to make 20? 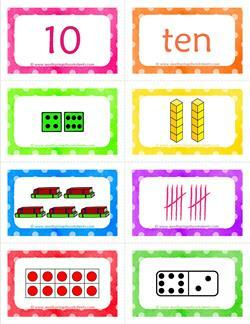 Hint: Look at the ten frames for a dead give away. 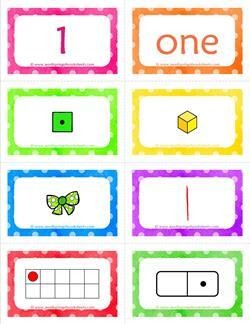 Have fun with these cards! 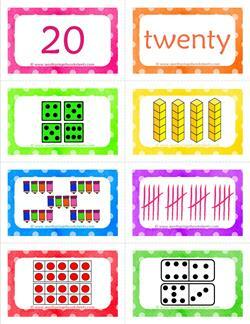 Now that you've reached number 20, have you thought about how many ways you can use these cool and colorful number cards? I can count at least six. 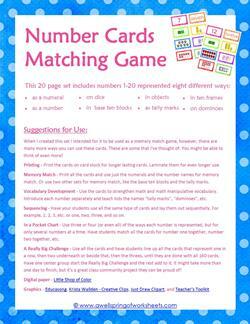 I created this number cards matching game to be a matching game. 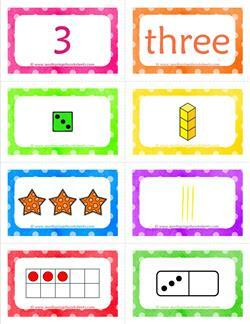 But there are other uses for these cards, too! 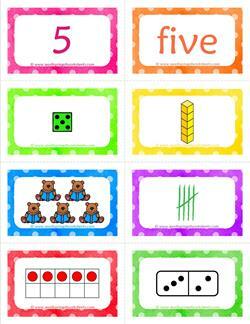 Check out this page for more ideas. Have fun!